Bankruptcy for farms in the Midwest rose sharply last year, and it's not just one thing that is pushing farmers over the edge. Esther Honig of Harvest Public Media reports that many of those farmers have been hit by a trifecta of trade disputes, continuing low crop prices and now extensive flooding. ESTHER HONIG, BYLINE: Corn is pouring into a semi-trailer at Ben Steffen's farm in Southeast Nebraska. BEN STEFFEN: We're loading corn out, and we will haul it to Atchison, Kan. That's about 80 miles one way. HONIG: Steffen calls this past winter brutal. On this frigid day in March, most farmers couldn't clear their snow-packed roads, but he could, which meant he got a bit more money for his corn. STEFFEN: We're in a situation where we're counting nickels and pennies on every transaction, and we're trying to capture every penny we can. HONIG: Over the last few years, farm income has dropped by half since hitting a high point in 2013. STEFFEN: When you've spent five years of your life pouring your energy into a business, and you're worse off today than five years ago, it feels like a crisis. HONIG: It's a dismal situation for many of America's commodity farmers, and it sparked concern that the ag industry may be on the cusp of a major downturn, like in the 1980s when scores of farms went out of business. One indicator could be the number of Chapter 12 filings - a special bankruptcy code for family farms. Last year, it reached nearly 500. DAVID WIDMAR: The data that I'm looking at right here suggests that actually we had higher bankruptcy rates in 2010 and 2011. HONIG: David Widmar is an economist with the website Agricultural Economic Insights. He says while overall the farm bankruptcy rates look relatively normal, to get the whole story, you have to look at all the numbers. WIDMAR: There are a lot of check engine lights on with the dash. The metrics that we all talk about are trending the wrong way. HONIG: Metrics like farm income. Widmar says trade disputes have hurt markets and slashed exports of major crops like soybeans. And Nathan Kauffman of the Federal Reserve Bank of Kansas City says that means excess grain is piling up, and it's pulling prices down to at or below the break-even mark. NATHAN KAUFFMAN: Whatever may or may not happen with trade policy, I think those supplies are likely to continue to weigh on commodity prices for the foreseeable future. KAUFFMAN: It certainly has not gotten to the point where I think that we would call it the kind of crisis that we saw playing out in the 1980s. HONIG: But tell that to the farmers in states like Nebraska and Iowa, where recent floods killed livestock and drowned hundreds of millions of dollars' worth of crops. 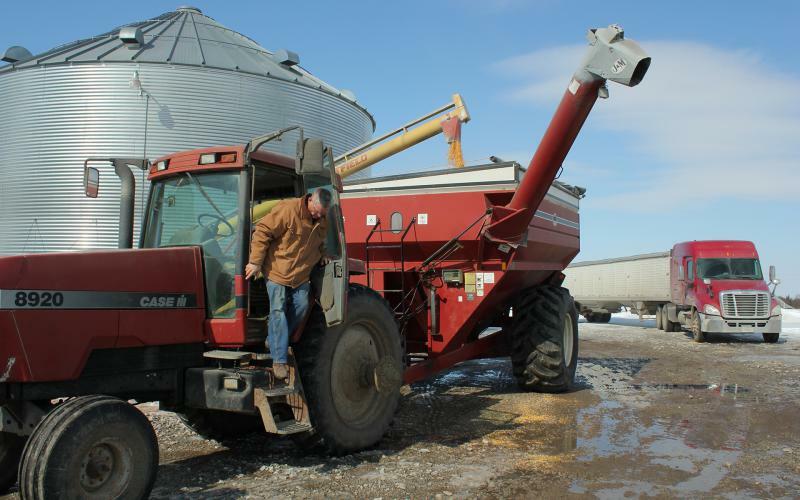 Nebraska farmer Ben Steffen says he dodged the worst of it, but if prices and trade continue to slump, he, along with many others, may have to file for Chapter 12. That's because this special bankruptcy code helps farmers resettle debt and stay in business. And if that happens, lawmakers want to be ready. CHUCK GRASSLEY: I'm also going to push ahead with reform of Chapter 12 bankruptcy because we need to update that law. HONIG: Iowa Senator Chuck Grassley says he wants to make sure more farmers can qualify for Chapter 12 bankruptcy. To do that, he's proposing more than doubling the amount of debt they're allowed to take on from around $4 million to about $10 million. For NPR News, I'm Esther Honig. GREENE: And Esther's story came to us from Harvest Public Media, a reporting collaboration focusing on agriculture and rural issues. (SOUNDBITE OF TRACE BUNDY'S "TIMEPIECE") Transcript provided by NPR, Copyright NPR.